Costa sunglasses have always been built in the USA, at their home in Daytona Beach, FL. Due to this, they take great pride in offering a collection of 2016 Costa USA sunglasses as a salute to the USA during the many patriotic events of the summer of 2016. The Costa USA Limited Edition Collection consists of seven frame styles, each with unique take on the red, white, and blue. Costa Anaa sunglasses are the perfect pair of shades for relaxing on the beach and looking good while doing it. These stylish sunglasses are made of heavy-duty TR-90 nylon, just in case you decide to test its durability. Equipped with plastic lenses which are lightweight, impact-and-scratch-resistant, and have 100% polarization which kills reflected glare and reduces eye strain, the Costa Anna is sure to make for a great pair of shades. Islanders around the world have figured out a way to live sustainably by making use of every part of the coconut tree. In result they learned how to make use of copra, which is dried and chopped coconut which then is pressed for valuable oil. Similar to the natural resources provided by the coconut tree such as shade and oil, these full-coverage sunglasses provide natural shade. With frames made with resin from the castor plant and reinforced with heavy-duty TR-90 nylon, the Costa Copra is built to last. In addition, its comfortable medium fit and 100% polarization, which kills reflected glare and reduces eye strain, work together to create a sunglass experience like no other. Sometimes you just want to take a break and anchor up at a small motu for some rest and relaxation with a cold drink in your hand. Costa Motu sunglasses feature a relieved face curve for total comfort, and an optical-quality spring hinge makes sure that much needed rest and relaxation becomes a reality. With a frame made of heavy-duty TR-90 nylon, you can trust that, while you relax, your new pair of durable shades will hang with the best. You might have gallons of brine in your face and 400 pounds on your hook, but the Costa Blackfin still won't slip. Slippage is stopped in its tracks due to the Hydrolite co-injected lining. In addition, its flexible frame and large fit creates extreme comfort. These Costa sunglasses were made to push the edge in sunglass performance, so you can push it everywhere else. In comparison, few waters can match the variety and abundance of marine life which makes up the Sea of Cortez. Built with linear venting, tough nylon material, and a large fit, the Costa Cortez was made strong enough to hold its own as you explore any body of water. In addition, Costa Cortez sunglasses were created with a comfortable large fit to make these sunglasses ready to handle wherever life takes you and to make sure you feel comfortable while doing it. A smaller model of the Blackfin frame, Costa Fantail sunglasses are 100% adventure ready. Its medium fit creates a more comfortable sunglass experience for users who need a smaller frame. However don't let the size fool you. The Costa Fantail comes equipped with heavy-duty TR 90 nylon frames, integral hinges, and 100% polarization, which kills reflection glare and reduces eye strain. So although these might be smaller in size, the Costa Fantail still comes ready to handle whatever adventure life might take you on. Off the coast of Baja California, Magdalena Bay has some of the best sport fishing in the world. Costa Mag Bay sunglasses feature an extra-large fit, made to handle big adventures in a fisherman's paradise. Its heavy-duty TR 90 nylon frame, optical spring hinge, and comfortable extra large fit make for a great pair of shades for relaxing or pushing the limits. Find the perfect pair of Costa USA limited edition sunglasses for your needs online at SportRx. If you need a little help in the seeing department, you’re in luck. 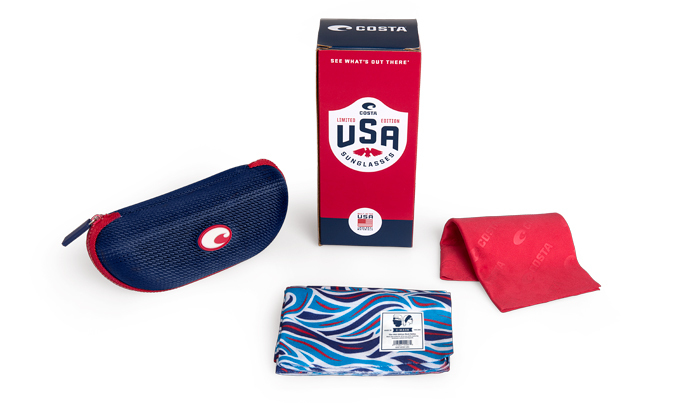 Costa USA limited edition prescription sunglasses are a real thing and the SportRx opticians are the real deal. Once you find your favorite pair, we’ll deliver you the best Costa USA Limited Edition prescription sunglasses. If you have any questions pertaining to Costa USA limited edition sunglasses, Costa sunglasses, or prescription sunglasses in general, we’re here for you, every day of the week! Contact us via phone, email or LiveChat and we’ll be sure to help you out.